Notes: A series of London premieres and live performances. (Also referred to as 'From the North'.) 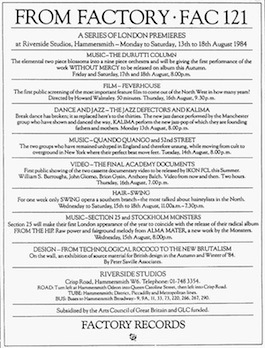 A 5 day residence at Hammersmith's Riverside Studios (13-18/8/84) with Factory bands, a PETER SAVILLE design exhibition and the Haçienda hairdressers 'Swing' (FAC 98). JAZZ DEFEKTORS & KALIMA. 13/8/84. QUANDO QUANGO & 52ND STREET. 14/8/84. SECTION 25 & STOCKHOLM MONSTERS. 15/8/84. THE DURUTTI COLUMN: 8/84. The Final Academy Documents' video premiere. 16/8/84. Swing. 15-18/8/84. 'From Technological Rococo to the New Brutalism': Peter Saville "source material" exhibition. 13-18/8/84. Also a poster (printed in metallic-bronze on a coral red background) and a leaflet.